WATER JET- A procedure that uses high-pressure water and a probe to create air passages in the soil. Primary reason for use is mitigation for compacted soil. It is recommended that water pressure be between 100-150 PSI. Water Jetting is preferable to vertical core venting (which uses an augur) due to reduced root damage. 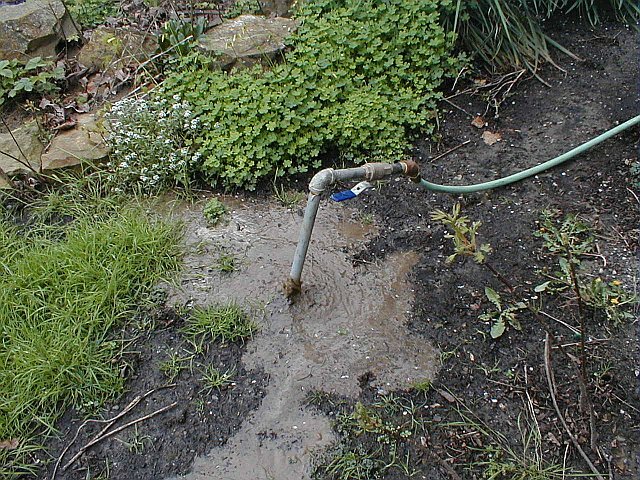 Water Jetting flushes soil out and does not compact the sides of the holes created. Water Jet can be used in conjunction with liquid fertilization only when soil and leaf tissue analysis indicate nutrient limitation. Click here for an instructional video on how to use the waterjet. Thanks to Sarah Hon Gaskin of A+ Tree for creating the video! 2 3/4 inch pipe "T"